The earth shook. Furniture, dishes, books, and more went flying, and structures shifted off their foundations. Traffic choked the streets. People had to evacuate their homes, so friends helped friends. "I was reaching for my car door when it hit," Long Marine Lab staff member Maria Choy was quoted as saying in the October 27, 1989, issue of On Campus, a former UCSC newsletter. "The ground started moving all around me. It was incredible." 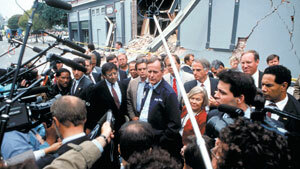 When the Loma Prieta Earthquake struck at 5:04 p.m. on October 17, 1989, the effect on the UCSC campus and immediate environs was dwarfed by the destruction that happened in the San Francisco Bay Area and elsewhere in Santa Cruz County--in downtown Santa Cruz, buildings literally crumbled and three people died. 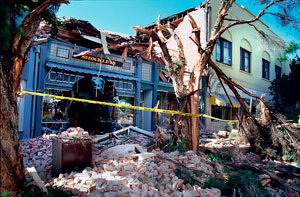 Watsonville was hit hard, as well; one person was killed by a toppled building in downtown Watsonville. In all, 63 people in Northern California, including six in Santa Cruz County, perished from the earthquake that day, whose epicenter was in the Forest of Nisene Marks State Park. But UCSC didn't completely escape harm in the 7.1-magnitude quake. The campus sustained $11 million in damage and property loss from the fourth-largest quake then ever recorded in California. Cleanup costs on campus were estimated at $1 million. For those who experienced it, memories of the shaking linger. "It's really vivid in my mind," said Choy, who still works at Long Marine Lab as an administrative specialist/office manager. 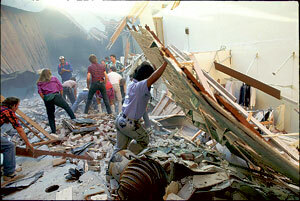 She had just reached her car outside the trailer that then served as the main office when the temblor began. "The thing that was incredible was to see the ground actually rolling. It was literally rolling. It was like out a movie." Heart pounding, she drove to John Street to pick up her small daughter at day care--all the children were safe. "You just kind of realize what's really important--you learn to appreciate every day that you get," said Choy. "But it also made me feel like, we have our earthquakes, that's part of living in California. But I'd rather live here than anywhere else. I'll take my chances with the San Andreas fault." The fault's slip and its aftermath captured the attention of the world. 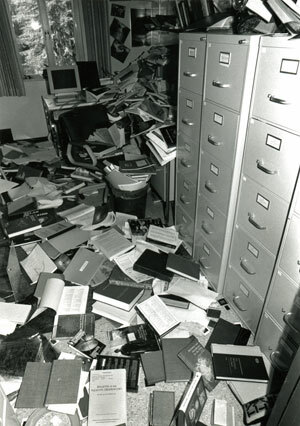 "In the days and weeks that followed the Loma Prieta Earthquake, UC Santa Cruz was a media epicenter for quake coverage," said Jim Burns of University Relations. "Local, regional, national, and even international reporters descended on the campus to interview quake experts from our highly regarded seismology laboratory. I remember, for example, helping a TV crew from Tokyo find their way to one of many press briefings." 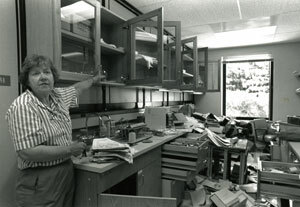 Karen McNally, who was a leading researcher in UCSC's Charles F. Richter Seismological Laboratory (now the W.M. Keck Seismological Laboratory), even appeared on the front page of an Italian newspaper. There was no loss of life on campus, however, and the structural damage was not devastating. Only seven minor injuries were reported at UCSC. There was damage to shelving on the upper floors of the McHenry and Science libraries and fireplace and chimney damage in various buildings. Also damaged were ceilings, flooring, interior and exterior walls, retaining walls, roadways, windows, sinks, toilets, lighting fixtures, and gas and water systems. Property loss and damage included scientific instruments, computing and general office equipment, torn and water-damaged books and magazines, musical instruments, and artworks. Students were evacuated from residence halls and remained outside until structural engineers cleared the dorms for occupancy. The campus's gas-powered cogeneration plant produced electricity the night of the earthquake, so portions of the campus had power while the rest of Santa Cruz County experienced a blackout. Twenty years later, UCSC has an Emergency Management program, housed within the UCSC Fire Department. Chris Gaylord, UCSC's emergency manager, said the campus now systematically plans for a variety of emergency situations, including earthquakes. The Student Affairs Division also maintains a standing emergency preparedness committee that conducts specific planning and preparedness efforts for the student population, including sheltering, feeding, and care. Each year, the UCSC Fire Department trains more than 700 students, faculty, and staff in American Red Cross-certified first aid, CPR, and automated external defibrillator use. Also, since 2005, more than 160 campus faculty and staff have been trained in the Campus Emergency Response Team program, a federal curriculum that encompasses disaster first aid, light search and rescue, and basic fire control. The campus's new Emergency Operations Center, which opened in 2008, is equipped with uninterrupted emergency power and redundant communication systems and is used during exercises as well as a variety of planned and unplanned events on campus each year to allow emergency personnel to practice their roles during a major emergency. The CruzAlert emergency notification system, also implemented in 2008, allows emergency personnel to rapidly communicate important information to the campus during an emergency.